1. I lack a sense of purpose. 2. I’m not satisfied with the way things are in my life. 3. I have a birthday within two or three years of 0. 4. I’ve been doing quite a bit of self-assessment lately. 5. I often think of quitting my job or taking early retirement. 6. My job does not satisfy my needs. 7. My lifestyle is unhealthy. 8. I’ve experienced one traumatic event in the past year. 5 or more yes responses suggest you may be disengaged from work and in a transition stage of your life cycle. If you would have responded the same way two or more years ago, get a medical checkup. Job and life dissatisfaction can seriously affect health. Realize we continue to change and grow throughout life. Although we all have our own rhythms of change, we generally proceed through alternating developmental and transition periods. Transitions are times for questioning who we are and where we want to go. During developmental periods we make commitments to and work toward desired goals. Simultaneously, we also experience the career cycle of entry, mastery, and disengagement. During entry, we enthusiastically learn new tasks. In mastery, we’re competent and productive. If our job duties are no longer challenging, we become disinterested and unproductive. Disengagement stages of career cycles tend to parallel transition stages of life cycles. Take advantage of the growth opportunities your transition provides. Reassess needs and goals, and make necessary modifications. Your career development is a continuing quest to improve the fit between your career and your developing personality. 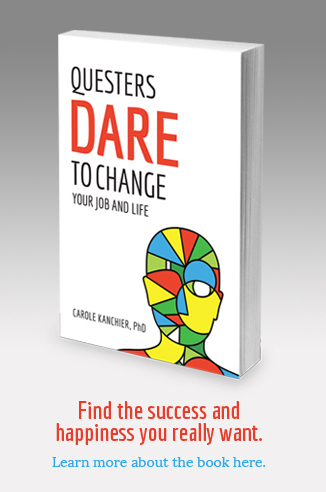 “Questers Dare to Change Your Job and Life” offers inspiration and tips for moving forward.